In May and June 2010, the Principal Ecologist from Natural England surveyed the school pond over a period of six weeks. It was noted that in the Year 2000 Great Crested newts (Triturus Cristatus) inhabited North Road School’s pond. The Great Crested or Warty newt lives only in Europe. Both they and their habitats are protected under the Wildlife and Countryside Act 1981. Our school has applied for a license so children can still undertake pond-dipping to learn about their natural environment. 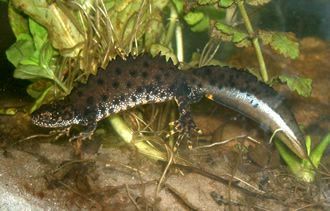 The Great Crested newt is the UKs largest species of newt, reaching a maximum of 17cm compared with a maximum length of 10cm for the two other native species, Smooth and Palmate. Adult newts occur all year round, but they are usually seen when they are breeding in ponds during the spring and early summer. Yes! All three species of newts were found in our pond. We have at leat four adult Great Crested Newts along with many Palmate and Smooth newts.